Product prices and availability are accurate as of 2019-04-24 22:15:05 CDT and are subject to change. Any price and availability information displayed on http://www.amazon.com/ at the time of purchase will apply to the purchase of this product. 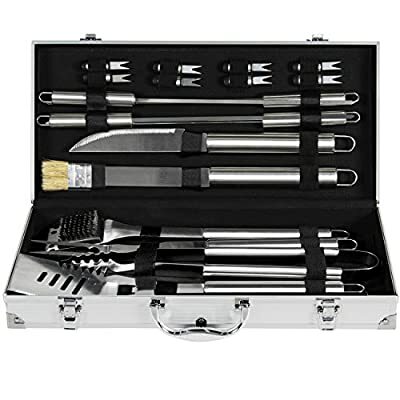 Best Choice Products is proud to present this brand new 19 pc BBQ Tool Set. Take out the grill and get ready to host your barbecues with the help of this fully equipped BBQ tool set. This set has all the necessary tools you need to start grilling all season long. 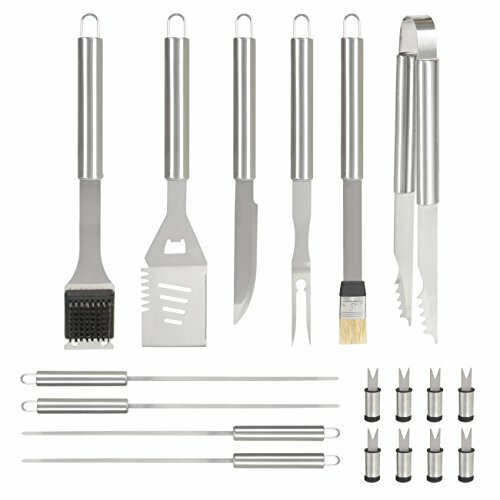 It is equipped with 18 grilling tools that include: 1 spatula, 1 fork, 1 knife, 1 basting brush, 1 grill brush, 1 pair of tongs, 4 skewers, and 8 corn forks. The spatula alone is 3 tools in 1. It is designed with a bottle opener and tenderizer blades on the side. Each tool is constructed of stainless steel for durability, making this the perfect set for all of your BBQ needs. They also have metal hanging hooks for convenience and easy storage around your grill or kitchen. 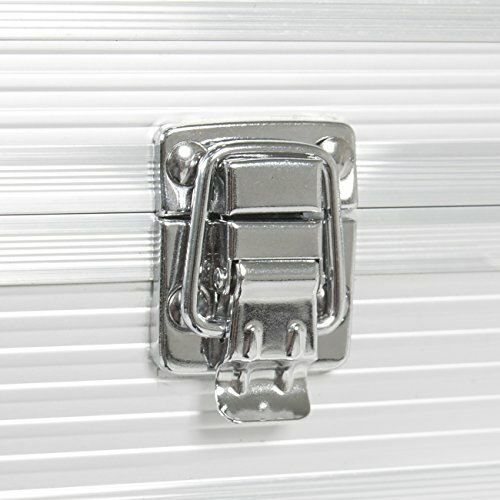 You can easily take it with you anywhere with the portable dual latched aluminum case. These dishwasher safe BBQ tools make them easy to clean and ready to use over and over again. 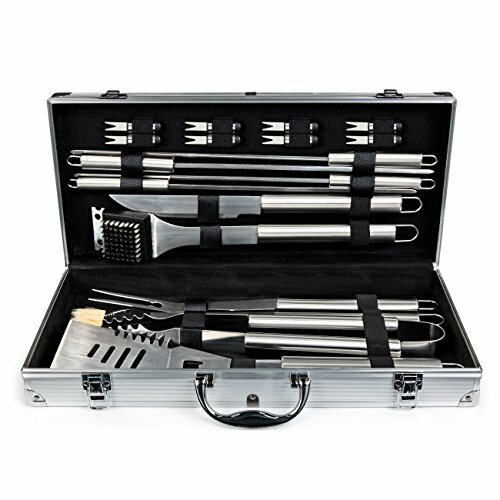 Get your grill on this season with the high quality and fully equipped BBQ tool set. We purchase our products directly from the manufacturer, so you know you're getting the best prices available. NEW PRODUCT WITH FACTORY PACKAGING. SPECIFICATIONS: Case Dimensions: 18. 25”(L) x 8. 25”(W) x 3”(H); Basting Brush Length: 16. 5”; Grill Brush Length: 16. 5”; Knife Length: 15”; Prongs Length: 16”; Fork Length: 16. 5”; Spatula Length: 17”; (4) Skewer Length: 17”; (8) Corn Fork Length: 2. 5”; Complete Product Weight: 5. 5 lbs. PLEASE NOTE: Our digital images are as accurate as possible. However, different monitors may cause colors to vary slightly. Some of our items are handcrafted and/or hand finished. Color can vary and slight imperfections in the metal work are normal and considered evidence of the hand-finishing process, which adds character and authenticity to those items.